sir, now small led lamps working with 4v or 3.7v small battery (using mobile phone charges) are common. so pls. include an automatic circuit for this type of lamps. SIR – with reference to your circuit -Diac controlled LED flasher – I want to put a ONE WATT RED LED (may be 2 numbers in parallel) instead of the normal single 5mm LED – reason – its brightness is to low, I need to place the circuit at distance of about 80 to 90 meters.. Kindly advice the changes required in the circuit. I am Kalai from Coimbatore. Can you tell me how can i hold charge in capacitor for some period.if there is any circuit, please send me. I have equation regarding the cell phone detector circuit. Which I would like to know the reason behind using 22PF C1,C2 capacitors. Would you please explain it to me. WORKING PRINCIPLE:The mains ac input power of the inverter is taken through the Prioritizer. When sufficient solar power is available, the input power to the inverter is disconnected and the inverter is made to work in battery in the backup mode. At the same time the solar panel will be charging the battery. Thus the Loads will effectively work from the solar power. When the solar power reduces, the inverter is connected back to the ac mains making it work as normal Inverter. hello sir …pls help us with the stress meter project …i can’t simulate that using isis….can you pls provide ur contact informations so i can reach you directly…..
sir…i am working on your stress meter project using LM3915…i tried to simulate the circuit in isis ..but it is showing errors like timestep too small…can you pls help me sir….? How can improve the mobile sniffer to recognise which phone is activated by finding the number. Have you any idea? respected sir, i am a class 12th student and want to make a wireless telegraph machine using IR sensors and IR diode please tell e how to make the circuits which can both recieve and transmit IR signals as a message. I noticed how you explained that a lower than design voltage (most appliances i believe are designed for 230 volts) actually consumes more electricity. I had two questions. 1. Wont the power factor get reduced in case of lower voltage. Watts is calculated as IXVXPf. So for example lets say an appliance is designed to consume 460 watts at 230 Volt and PF of 1 (implying 2 amp current), so when the volt drops to 200 volt, the current jumps to 2.3 but the power factor is reduced to 0.8 so the total power consumed remains the same? My domestic electronic meter rating is 10-40A. it shows EL led blinks. when we remove all appliances and switch off everything, sometimes it glows and sometimes remain off. my bill is also very high every month. i have got all the electric points checked by the electrician. he says there is no leakage of current anywhere. now please suggest me, what should i do? whether change the meter or ? I made the count down timer circuit provided by you but the problem occurs of timing precision. Switching was not done at calibrated time. I drive 1 watt LED as load through transistor, I want to turn off LED after 6 hours. But LED sometimes turn off after 5 hours , sometimes it turnoff after 5.15 hours, everytime reading is almost different. Please give me suggestion to obtain precise timing. ( ESK 77 ). Can some components be changed to make the dimming more noticeable ? The 50K or 100K pot are similar in performance. I’d like to dim it down to a dull glow for a night light, or max brightness for a torch. I am interested in LED STRING driver circuit. I want to drive 60W inductive load using SCR Pcr406. Time interval of on time and off time will vary. Can u help me in getting some insights in to induction and resistance heating and the difference between induction, Resistance and electric furnace heating. 1) CAPACITOR IS THE CHARGE STORING DEVICE BUT HOW CAN IT HAVE ITS FIELD IF THIS CAN HAVE FIELD EVRY CAPACITOR CAN HAVE IT ? 2) WHAT IS THE REQUIREMENT OF ANTENNA THEN IF CAPACITOR IS DETECTING ? 3) CAPACITOR HAVING ITS FIELD AND ACTING LIKE AN ANTENNA THATS THE MAIN QUESTION BY THE FACULTY. 2)Capacitor C3 in conjunction with the lead inductance acts as a transmission line that intercepts the signals from the mobile phone. This capacitor creates a field, stores energy and transfers the stored energy in the form of minute current to the inputs of IC1. Sir, currently I am doing the mobile bug circuit. But unfortunately, the LED automatically turned on whenever I powered up the circuit (no active mobile activity around), but the buzzer didn’t sound either. Can you rectify what’s the cause of this error? FYI I assembled the circuit on breadboard and not PCB. Or is it necessary to use PCB instead of breadboard? Also, what’s the effect if the C3 lead length is shorter than the required 18mm? Thanks you, hope to get your speedy reply soon. Yes.I will post a circuit. 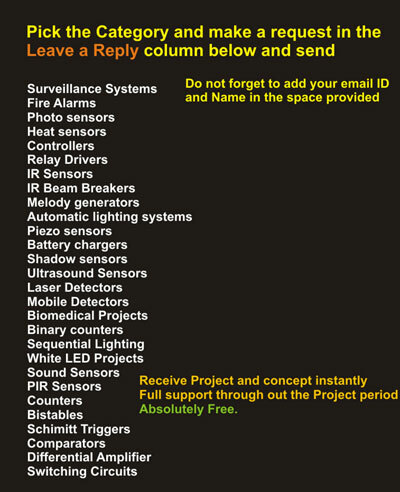 You need circuit using smoke sensor or simple light obstruction one? I want completed lm 3914/3915/3916 circuit board. who will supply?. Hello, I’m Professor of Physics at the city of Londrina in Brazil, I liked the design fordetector cell, I would mount the circuit in question, got help from an engineer to give me some tips, most do not get a solution for increasing range, you have the solution for a greater range between? about 10 meters for example? Agredeço muchattention, and congratulations for the project. I have been trying the Skin Response Meter published by you in EFY. Can you explain me the construction of a VU meter in the circuit given. I wasn’t able to get the reading correctly when i tried it with a voltmeter. I would like to build a circuit to toggle a 12V or 48V DC relay directly from mains, without using a transformer. Do you have any idea to suggest? Try a transformerless design given in the blog. But the relay should get more than 100 mA current for holding the contacts. Usually relay driver uses DC from transformer. So kindly help Sir ? I have 2 extra Mobile batteries which is 3.7V which i want to use for my ringing bell and it requires 6V to operate. Currently my ringing bell is on adapter. which gives 6V but when no electricity that time it should operate from these batteries and also charger for these batteries. I need a circuit for this. pls. help me. Yes, 6 volt Charger with automatic backup Backup. Sorry, I can’t able to find it. Please replay me the link for this. Yess.. I got the link…. Thank you V. Much. I will try this out. i think i am making a mistake in the value of the capacitor used in transformerless power supply. 225K as u say is 2.2 microfarad but acc. to my information and confirmed by various conversion charts on the net it is .22 microfarads. kindly enlighten me. naturally my circuit cld not give proper load current becaiuse of this mismatch. don’t kow if you receive my last request but here it is again, I nee to know if I could get the 74LS47 chip and if so I need two of them, and how much it cost and when can i get it. 74LS 47 is the commonly available BDC to 7 Segment Decoder/Driver IC . You can purchase it from your nearest shop at very low cost. Re: Fast Charger with Auto cut off. see is a resistor with no VALUE. Can you please be kind enough to give me some of your time let me know by email reply? Great stuff you upload, keep up the good work…very helpfull indeed to learners. In TV guard Circuit, where i connect ground. The TV Guard circuit is connected through the cable to the TV socket. The cable has a center copper wire called Core and twisted thin wires around the core. This is the Shield which is the ground. You can connect the circuit as shown in the diagram. Simply cut the cable and insert the circuit between the cable and TV socket. Yes ,you can modify the Remote controlled Master switch as an IR beam cutter alarm. Following changes are required. 1. Remove LED1, R2 and C3. 2. Replace T1 with BC 548. 3. Connect 10K resistor between the base of T1 and ground. When IR beam falls on TSOP 1738,its output turns low and T1 remains off. Pin 3 of IC1 gets low voltage level than pin 2 and its output remains low. When IR beam breaks,output of TSOP 1738 turns high and triggers T1 which in turn gives current to pin3 of IC1. Its output turns high and relay energize. I’d like to use Remote Operating Master Switch in cooperation with an IR transmitter as an alarm system. What do I have to change in Remote Operating Master Switch schematic to make it act like an IR beam cutter?